Exhibitus is the second solo exhibition by Cape Town artist Lucie de Moyencourt. Self-taught, this show pays homage to her informal and idosyncratic art-training. De Moyencourt's work was developed through the art of observation in her daily life, as well as by being exposed to European art from a young age through visits to family in France. For the past twenty years de Moyencourt has recorded both the important and the banal through ink and water colour in sketchbooks which she always carries with her. By observing and capturing these everyday moments, her eye has been trained to see life as a series of paintings. While most people will photograph a family lunch or a holiday in Europe, Lucie will pull out her sketchbook and record the moment in expressive and immediate marks that often capture more than a camera. Her paintings are always positioned from her view and will often include humour and the atmosphere of moment. 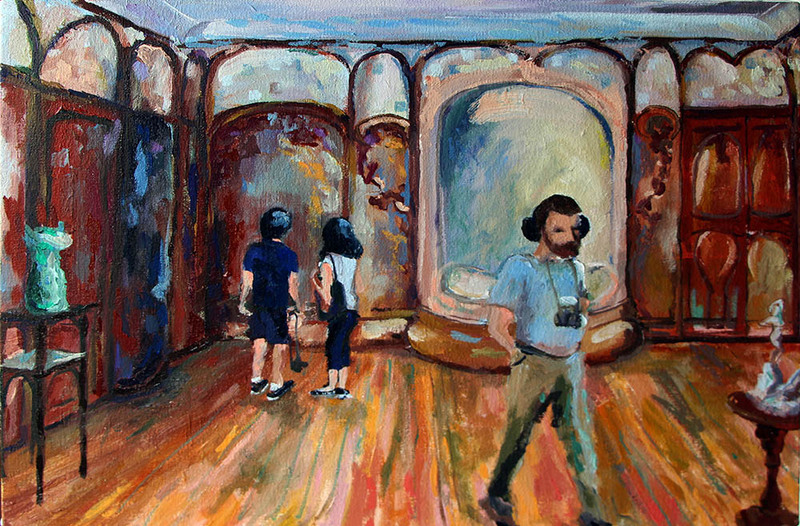 In Exhibitus, de Moyencourt takes us with her on a recent Summer trip to Europe. Her ink drawings are her diary and act as an itinerary of her travels. We are given access to the great museums and galleries of Europe through her paintings and we gain insight into which works the artist herself is drawn to. While Lucie grew up being inspired by the works hanging on the gallery walls, de Moyencourt now turns her gaze to those in the act of observing art themselves, often with the aid of technology. 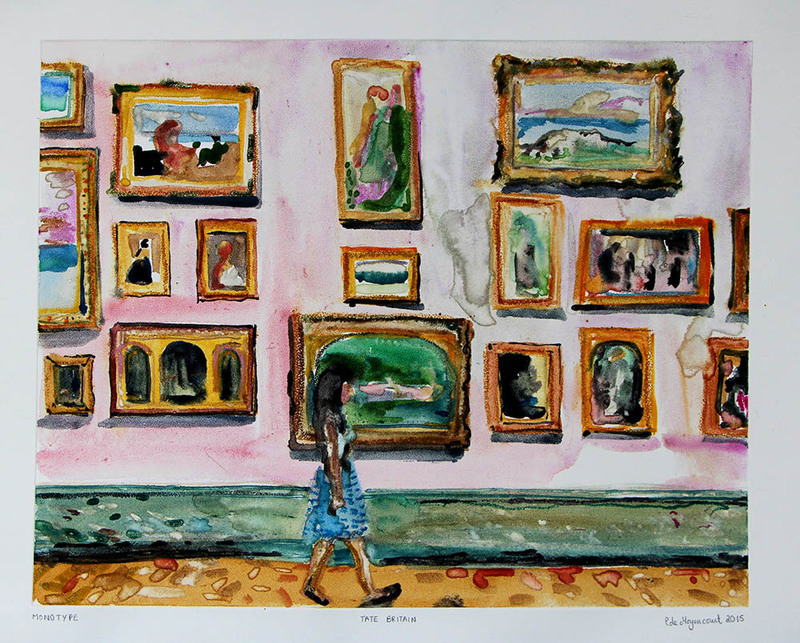 She has observed a contemporary disconnect between the viewer and the works on the wall, which she exposes in her light, playful way. 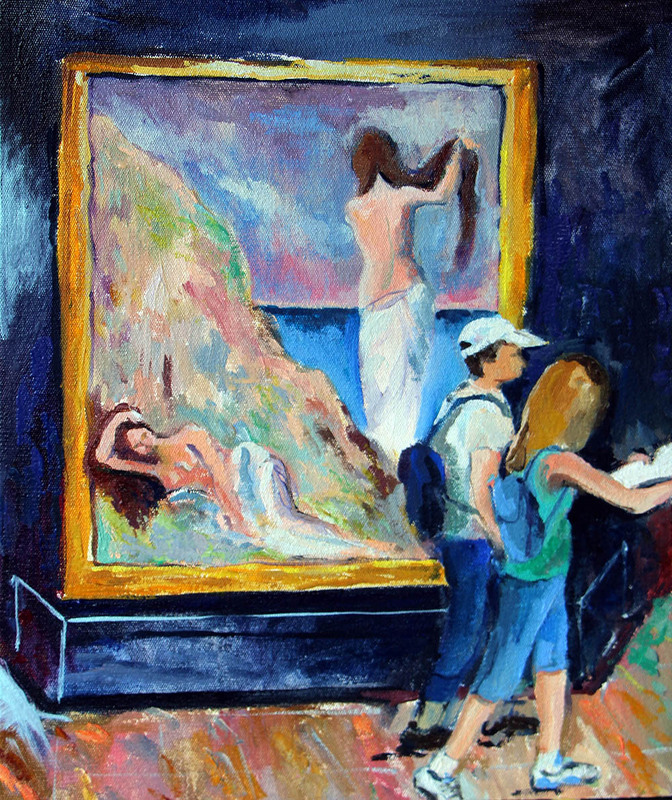 This exhibition of paintings of people looking at other paintings, creates an illusion of ever-receding works within works within works, a term called mise-en-abymes. And so this show highlights the tension between art history and technology, the image and the making of an image and ultimately the masterpiece and the mundane. *This show is very special because its the first time that Lucie has torn out pages of a sketchbook and exhibited them. 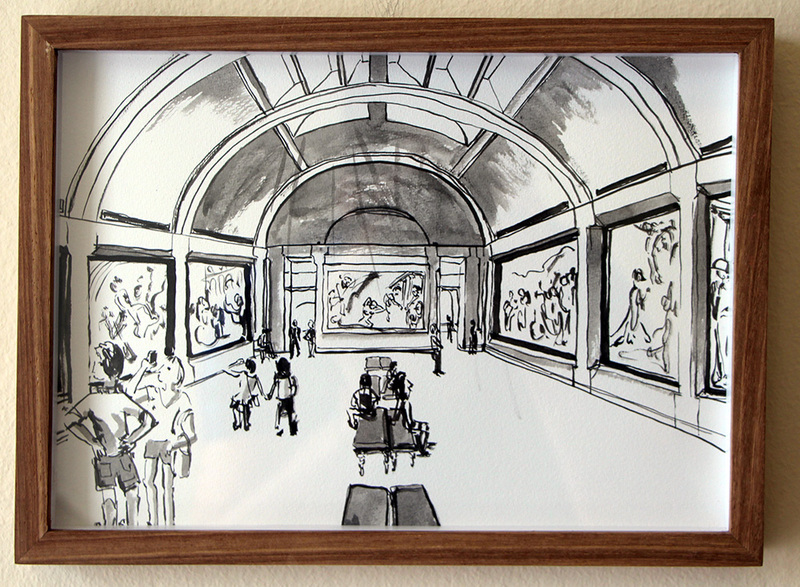 The 15 framed sketchbook pages you see hanging on our gallery walls are the reason that Exhibitus came to be. **The larger oil and monotype works were created in her Seapoint studio through the use of digital photography print-outs, which further explores the complex role of art, technology and observation.